‘Some doctors believe they have a duty to preserve life at all costs. There is no such duty’. Collaborative work as an artist with surgeons and their patients over several years has produced much artwork and many questions. The issue that I wanted to focus upon for the work that I chose to exhibit at the world congress and also for the AERG ‘Fieldworks’ exhibition in Berlin is the notion that medicine is becoming the new religion and more significantly, how the patient views their surgeon as a miracle worker, a saviour figure. A large part of my work as an artist working within medicine has involved spending time with patients of Mr Mike Papesch FRACS and Mr Paul Stimpson FRCS ENT Consultant Surgeons who specialise in head and neck cancers. After observation of the consultation I invite the patient into another consulting room where we discuss their experience as a patient. Here they are free to express their thoughts and feelings about being in the medical environment, a particularly vulnerable time for them. On their printed photographic portrait often they write just one word eg ‘surreal’, ‘routine’ or perhaps an illustration of how they feel eg a drawing of a boiling kettle, this work is dependant upon their individual experience. Repeatedly I have witnessed them discussing and illustrating on their portrait their thoughts of the surgeon as ‘a miracle worker, a saviour figure’. When facing a potential life limiting disease surgeons have been gifted the power to prolong life. This situation is exacerbated when a person has no faith and time on earth is all that they can hope for, naturally they desire to extend this time. In the main and due to many reasons, the patient has a passive part in the relationship dynamics and displays much reverence to the consultant who holds the power to heal. ‘Medicine has become the religion of modern times. Since Louis Pasteur, the deep Christian founder of modern day medicine and father of vaccines, the beliefs and practices of traditional Christianity have been transferred into medicine: physicians have taken the place of priests; the search for health replaces the quest for salvation; the hope of physical immortality (through cryonnisation, cloning and genetic manipulation) will soon take over hope of eternal life; vaccination plays the same initiatory role as baptism; and a hypothetical universal vaccine shall save all mankind from illness, tomorrow, just as the Saviour atoned for the sins of the world’. In the Middle Ages, doctors blamed amongst other things, sin for ill health and subsequent cures involved prayer. The intention of my work for the AERG is to highlight this phenomenon of projection and transfer of religious content that takes place within medicine. Emma Barnard is a visual artist specialising in lens based media and inter-disciplinary practice and research within Fine Art and Medicine. Her work deals with social commentary, seeking to highlight contemporary issues and encourage debate surrounding them. 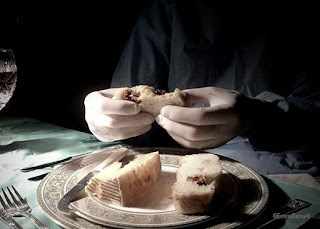 Her "Patient As Paper" (co-founded with Mr Mike Papesch FRACS, consultant ENT surgeon) artwork is currently being exhibited widely in galleries, universities and hospitals in England and internationally. It has been presented at several conferences within the medical and medical humanities fields, and most recently at University College London, Medical School and in a series of presentations at Surrey University for the Department of Health Sciences. The experience Emma has gained through several years of working with consultant surgeons and their patients from various disciplines, including ENT and Psychodermatology, is now influencing the field of medical education. At King's Medical School in London Emma has led a highly successful pilot project to introduce art into medical education, undertaken in conjunction with a critical care consultant and a 4th yr. medical student. Most recently she has taught on a pilot project within the Department of Medical and Health Sciences at Surrey University and has led on workshops for students on the MBBS Stage 2 GP Longitudinal Placement, GKT School of Medical Education.